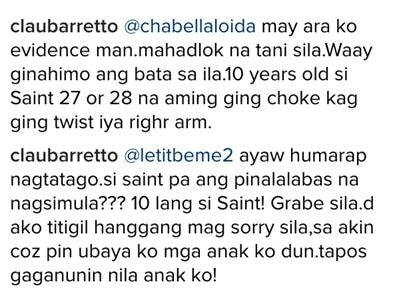 Claudine Barretto says a 28 or 29-year old adult physically attacked her son. 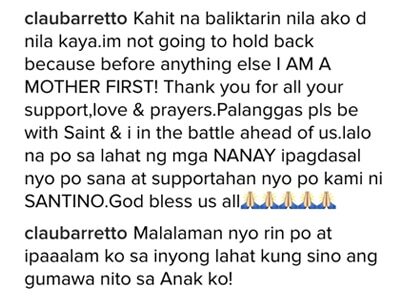 Claudine Barretto couldn’t contain her anger in her Instagram post where she showed a photo of her son Santino after allegedly getting injured from a physical attack by an adult. “Nagkamali kayo ng SINAKTAN!!! You hurt my Son PHYSICALLY GOD FORGIVE ME SA ANONG GAGAWIN KO SA INYO!!!! [sic]” she wrote. In the comments section, the Optimum star further explained that her son got choked and an adult aged about 27-29 years old twisted his arm. Claudine also resented the fact that her estranged husband Raymart Santiago has not yet done anything to defend their son. “Sana nga maipag laban niya anak niya kahit minsan lang sa buhay niya. Pamilya nya kasi yun kaya malamang gusto nya walang gulo pero pwede ba namang palagpasin dahil lang pamilya nila?” she said. 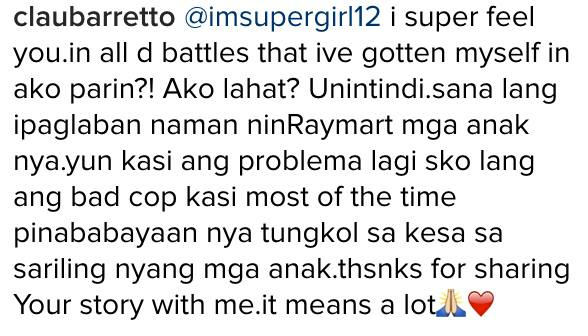 She also uploaded a photo of Santino’s medical certificate and he was diagnosed with soft tissue contusion.